Twenty-three years ago while serving in a management job, my organization required assistance from a consulting firm. The CEO of that firm formulated a service proposal in consideration for a $37,000 fixed fee. At the time, to me that seemed like a lot of money, so I scrutinized everything and asked for opinions from many constituents within and outside our organization. During this process, which lasted more than a month, this CEO said something to me I have never forgotten. He said, “As your career advances you will need to learn to make much faster business decisions or you won’t be successful.” At the time I may have bristled at the advice, finding it counterintuitive. Within a year actual experience confirmed he was right, so I committed to working toward becoming a decisive leader. In life and business, we almost never have the benefit of making decisions with a comprehensive data set and with full visibility into risk-adjusted return characteristics. Decisions still need to and can be made. Why do we often suffer from the illusion that quality of business or clinical decisions is linearly related to time taken to make them or the amount of deliberation? Why do we tend to emphasize elongating decision cycles and de-emphasize crispness of decision execution? I have a good friend who is CFO of a large health system. He was recently explaining a joint bundling arrangement his 500+ bed hospital established with a Fortune 10 self-insured employer. Under this program, patients requiring hip or knee replacement joints were covered for the entire care episode for approximately $22,000, with a 60 day post-operative guarantee. All of these cases are allocated to their top six orthopedic surgeons who maintained an average operative time of 42 minutes. The hospital makes an attractive contribution margin on these cases and patients receive excellent quality because the surgeons are fast. The surgeons are fast because they are experts in this specific procedure. A delayed decision is a decision in itself. Decision quality atrophies just like muscle. 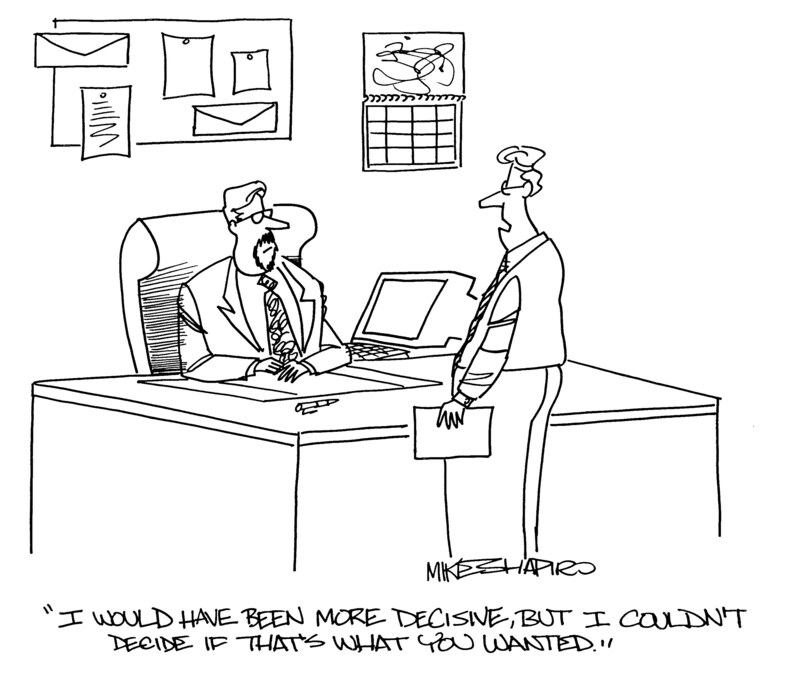 Decision cycles reach critical points after which more information, more time elapsed and more deliberation do not improve the quality of the decision and may make it worse or adversely impact the opportunity or risk the decision was originally intended to exploit or ameliorate. When given adequate data and priorities, make the decision, then focus all of your energy on great execution. If the decision is wrong, learn from it, but don’t let mediocrity, bureaucracy or the convenience of delay affect the speed of your decisions. If you do, your competitors may intercept the value stream that could otherwise belong to you. My encouragement to fellow leaders is to first make certain you have established clarity and buy-in around your organization’s purpose, values, strategic mandate and highest priorities. This context combined with reasonable data, judgment and an adequate level of alignment from your team should be enough to enable a decision. The best leaders make really fast decisions around their highest priorities and require the same from their teams. Just think: how much better would our industry be with more decisive and principle-centered leadership?